Hope it helps someone struggling to find replacements!!!!!!! LIST IS FOR FRONT ROTORS ON THE FZR RANGE OF 1000'S AND 750'S WITH 320MM FRONTS, NOT REARS. Last edited by ozzyfzr on Fri Oct 03, 2008 3:08 pm, edited 1 time in total. thats a great list. are the bolt patterns the same on all of these also? Target30 wrote: thats a great list. are the bolt patterns the same on all of these also? Nice one Mate, well done WIKI material for sure !!! How about a sticky on this one? And maybe lock the thread? What do you think rage? Most of these are for the rear brake only. I've got a spread sheet that also has front brake compatability that I'll try to get posted up tonight. The WIKI has the FZR brake model number from 3 different manufactures that I used to cross reference to find other makes that use the same disk. The front brakes are only 298mm as well not 320mm. 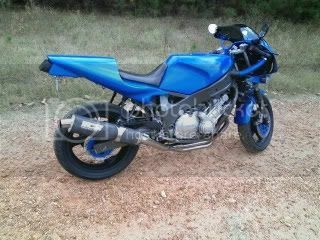 95FZR600 wrote: How about a sticky on this one? And maybe lock the thread? What do you think rage? To answer your questions I have edited the original post at the bottom, to save scrolling up, the list is "320mm FRONT" rotor replacements with the same stud/bolt pattern and offset! That makes more sence now. All of those are for a FZR 750/1000. Most of us thought you were talking about the 600 since that is what most of us have. ozzyfzr wrote: To answer your questions I have edited the original post at the bottom, to save scrolling up, the list is "320mm FRONT" rotor replacements with the same stud/bolt pattern and offset!